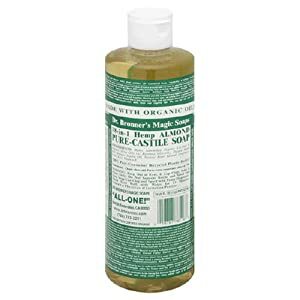 The super hydrating Dr. Bronner’s Baby Mild cleaning range is marketed as perfect for babies, children and anyone with extra sensitive skin or allergies. Products within this range include liquid soap and body balm. My children’s skin is prone to dryness and a little eczema so this was worth a try. It seemed to do a lovely job as much as any really mild organic soap. I was quite happy with it. The USP with Dr. Bronner’s Liquid Soap is apparently its affordability and versatility. It is said to have 18 uses from 1 bottle. No matter whether you are having a shower or cleaning your kitchen, the baby mild liquid soap is ideal for everything and anything with its odourless scent. The recipe is based on a simple, ecological, vegetable based formulation, named after the Castile region of Spain where olive oil soaps were invented. I had a go art cleaning the kitchen with it and it was fine but then I didn’t want to use it on my baby. I guess it is a mindset change needed here. It just felt a bit weird. I am sure it is a convenience budget option. But i do like to keep baby products clean and away from any germs so not sure if i would want to the bottle to double up as a kitchen cleaner really. The organic baby mild balm is to use after you have bathed your child with the Dr. Bronner’s Baby Mild soap, as it restores and moisturizes skin without being greasy. Based on pure organic oils and beeswax free of petro-chemically modified ingredients, the organic jojoba oil with organic beeswax avocado and hemp oils soothes dry skin leaving it soft and silky. This totally moisturized my daughter’s skin and I was very impressed with it. Lovely stuff. Also available in peppermint, Eucalyptus, Citrus, Almond, Rose, Lavender and Tea Tree which can even be used to treat minor cuts and grazes. Previous Post Did you budget to be a stay at home mum? I will have to try this on my little one, as I am fan of non scented products because of the chemicals used to make it smell good. Rhal recently posted..Don’t always Buy Expensive Healthy Food?